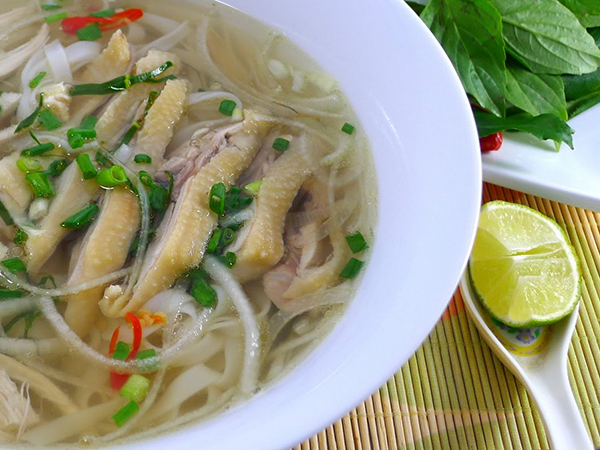 It is not unusual to see many chefs to cook Pho with both beef and chicken soup in the same pot. However, in the opinion of many North Vietnamese chefs, Pho Bo and Pho Ga should be two separate versions of the dish. They believe that because of the strong beef aroma, more spices like star anise should be used to overpower it, while in the chicken variant more shallots, onions and roots should be used to empower its sweet taste and aroma. The chicken variant of the soup also takes a lot less time to prepare and cook than the beef version, but still tastes amazing. fish sauce, Sriracha chili sauce, hoisin sauce, pickled garlic, fresh chilli peppers.